Electro Static Technology (EST, AEGIS) guarantees that AC induction motor bearings will not fail from electrical fluting damage when AEGIS Shaft Grounding Rings have been installed with new bearings in accordance with EST's recommended best practices, as published in the AEGIS Bearing Protection Handbook (current edition). The AC induction motor must meet the conditions listed below and new bearings must be installed at the time of AEGIS Ring installation for the warranty to be approved. For repaired motors or for field installations: Upon registration and approval the warranty shall be for 2 years from the installation date of the new motor bearings and AEGIS Ring. For new motors with AEGIS rings installed by the motor manufacturer: Upon registration the warranty shall be for a 2 year period after the motor manufacturer’s bearing warranty ends. If electrically induced bearing fluting damage occurs, EST will pay the current Vaughen’s National Average Price for "Furnish/Install 2 Standard Ball Bearings" and will supply a new shaft grounding ring (SGR or PRO as appropriate) and AEGIS colloidal silver coating (CS015). The warranty shall apply to any AC induction motor whether new or repaired which conforms to the AEGIS Bearing Protection Handbook’s best practices. 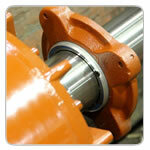 For All Motors: New bearings MUST be installed at the time of AEGIS Ring installation. All Motors: For this warranty to be valid, the owner must register the motor within 30 days of receipt, by filling out and submitting the form below. For AC Induction motors up to 100 HP: The warranty shall apply when AEGIS Rings have been installed on the motor per the AEGIS Bearing Protection Handbook’s best practices. AC Induction motors greater than 100 HP: The warranty shall apply when AEGIS Rings and insulated bearings/insulation have been installed on the motor per the AEGIS Bearing Protection Handbook’s best practices. AC Induction motors greater than 500 HP and ANY motor with supply voltage of greater than 600 VAC (medium/high voltage): The warranty shall only apply when AEGIS PRO Series Rings and insulated bearings/insulation have been installed on the motor per the AEGIS Bearing Protection Handbook’s best practices. The best practices shall apply per the current edition of the AEGIS Bearing Protection Handbook at the time of installation. The current best practices can be found here. The owner of the motor must verify that the installation of AEGIS Rings and bearing insulation, if applicable, was per the AEGIS Bearing Protection Handbook’s best practices in order to receive approval for the warranty. EST shall retain the sole authority to issue and approve the warranty for any application. The warranty shall be activated and conferred to the motor owner upon the issuance by EST of an email or certificate confirming warranty acceptance. All warranty applications shall be made by filling in the form below. *All fields are required except: State/Province (required only for US/Canada) and the Installer Information section (not required for motors with AEGIS factory-installed). If the AEGIS ring was not installed by the motor manufacturer, please fill out the installer’s information below. Repaired motors MUST have new bearings for this warranty to apply. IF the motor is repaired: Are the bearings new? Note: On motors over 100 HP (75 kW), if only one bearing is insulated, the AEGIS Ring must be at the opposite end from the insulated bearing.